The United Arab Emirates is a modern and dynamic country that attracts hundreds of thousands of tourists annually. The UAE has become on the top list of preferred destinations in the world thanks to the excellent infrastructure, top attractions, luxurious facilities and overall the higher levels of safety. Tourism is one of the UAE fastest growing sectors. The UAE consists of seven emirates which are: Abu Dhabi, Dubai, Sharjah, Ajman, Umm al Quwain, Ra's al Khaymah, and Fujairah. Each and every emirate has its own charm. In this article I will try to talk about some of the most amazing and a must see places in each emirate. 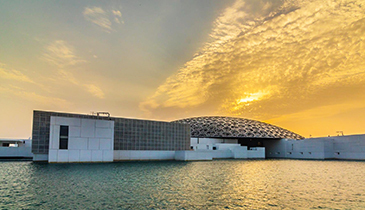 First of all, the Abu Dhabi, the capital, has recently opened Louvre Abu Dhabi, an art and civilization museum located on the Saadiyat District Island, with 8,000 square meters of galleries, making it the largest art museum in the Arabian Peninsula. Artworks from around the world are showcased at the museum, with particular focus placed upon bridging the gap between Eastern and Western art. Abu Dhabi also has the Warner Bros World which is an indoor amusement park that features characters from Warner Bros’s franchises, such as Looney Tunes, DC Comics and Hanna-Barbera, among others. The park is located on the Yas Island near the Ferrari World and Yas Waterpark. The Abu Dhabi’s modern Sheikh Zayed Mosque have branded the UAE as an up-to-the-minute luxury destination with an astonishing capacity of 40,000 worshippers and visitors. Al Ain city is the biggest city in Abu Dhabi and it has the coolest green forests in the UAE with the biggest zoo in the country. It’s also well known for safari as many tourists visit it to enjoy the sand activities and Bedouin lifestyle and it has the oldest museums in the UAE Such as Al Ain National Museum. The world-famous Dubai is the most common entry point for travelers. It is the transport and commerce center of the UAE. Burj Khalifa is one of the country’s most famous buildings. Not only it is the world's tallest building, but also it lays claim to the titles of tallest freestanding structure in the world. There is also the Deira district, with its world-famous gold market and old fish market. Dubai is also the home of Burj Al- Arab, the famous landmark that was built by Korean companies. It also has the Global village, which claims to be the world's largest tourism, leisure, shopping and entertainment project. It is the region's first cultural, entertainment, family and shopping destination. Every year, it has over 5 million visitors. Dubai Marina is an affluent residential neighborhood known for The Beach at JBR, a leisure complex with al fresco dining and sandy stretches to relax on. Smart cafes and pop-up craft markets line waterside promenade Dubai Marina Walk, while Dubai Marina Mall is packed with chain and luxury fashion brands. Upscale yachts cruise through the large man-made marina, where activities range from jet-skiing to skydiving. Dubai has many theme parks such as Lego land, Bollywood park and others. Sharjah, the cultural capital of the UAE, has one of the best museums in the country to focus on the full breadth of Islamic history and culture that holds a wealth of fascinating and well-laid out exhibits. The world’s largest book fair is annually held in Sharja, where many thinkers and writers can meet and discuss art and literature. Ras Al Khaima, has one of the best sea resorts in the UAE such as Rotana sea resort and Ras Al Khaima resort. It also has a very high mountain that has snow on the top of it. It’s really one of the most unique places that you can see real snow in an area that temperature reaches over 50 degrees. If you really want to enjoy diving, you must pay a visit to Fujairah. It’s really famous for fabulous beaches and amazing seafood. It also contains high mountains which is just perfect for hiking lovers. Fujairah also has the oldest mosque in the UAE, Al-Bidyah. The entire surrounding area is an archaeological site, where many pottery and metal artifacts have been excavated. For beach lovers, the UAE would be the perfect destination as the country has a number of amazing beaches and waterparks which are breathtaking. This could especially be found in Ajman and Umm-al-Quwain, where water-sports such as diving, jet skiing, stand up paddle boarding, and snorkeling are also available at many resort locales. In addition to all of that, there are more tourism spots to explore in the UAE. You need to go and enjoy by yourself. The country is full of endless charming destinations that won’t stop surprise you. See you in UAE.